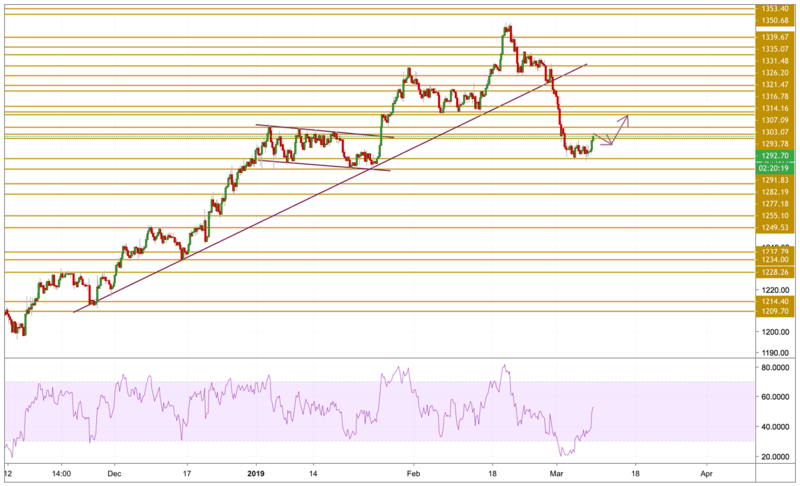 Gold prices gained some positive traction on the last trading day of the week and was seen building on the overnight attempted bounce from over one-month lows. A fresh wave of global risk-aversion trade, as depicted by a sea of red across global equity markets, triggered by a sharp fall in Chinese exports data for February, turned out to be one of the key factors underpinning the precious metal's relative safe-haven demand. This coupled with a modest US Dollar pullback from YTD tops, touched in wake of dovish ECB-led slump in the shared currency, provided an additional boost to the Dollar-denominated commodity and remained supportive of the bullish intraday positive momentum. Gold prices got freed from the tight consolidation and climbed above the $1990 level. Momentum turned bullish after it regained traction and looks the recovery will probably continue once the $1993.78 level will be violated. We will be focusing on the $1303.07 resistance level.